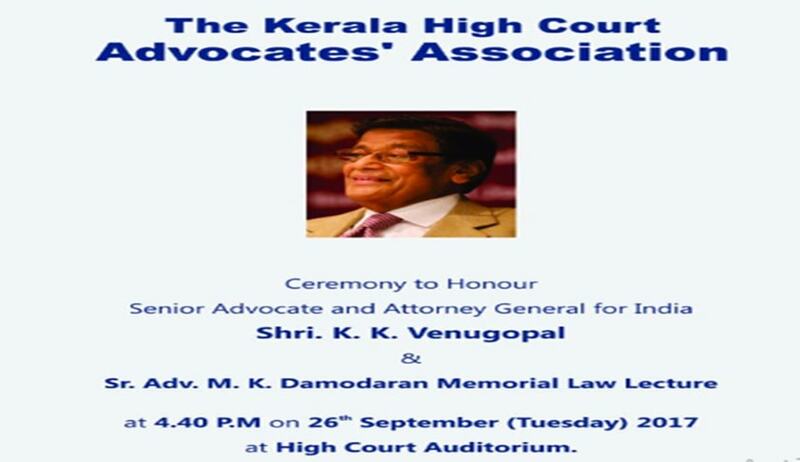 The President & the members of the Executive Committee of the Kerala High Court Advocates' Association cordially invite you to attend the Ceremony to Honour Senior Advocate and Attorney General for India Shri. K. K. Venugopal & Sr. Adv. M. K. Damodaran Memorial Law Lecture on the topic "Evolution of a powerful Supreme Court"
Senior Advocate Shri. K. K. Venugopal a proud son of Kerala has brought fame to the State again by his present appointment as the Attorney General for India. He assumed office on 30.06.2017. In 2015, Shri. K. K. Venugopal was conferred Padma Vibhushan award by Government of India in recognition of his eminence and outstanding contributions to the nation. He had previously received the Padma Bhushan award. Click here for access to the invitation. Click here for more details of the Programme.